Location:Not visible from highway, good views of them from Mt. Cline or Cline/Resolute Col. SW Peak is the leftmost peak in picture. They are accessed via Thompson Creek for the side shown, or Cline River for the backside. Ice: Never seen them in the winter. Rock: Too far to walk to go rock climbing! Alpine: A few routes have been done on the Whitegoats but details of most are scarce. The potential for new routes is huge on these big remote peaks. A number of cool looking lines are just begging to be climbed. 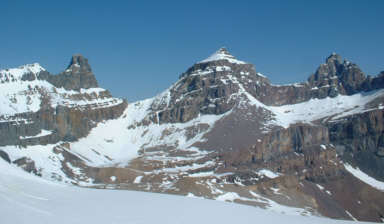 Usually a full day is needed to reach a camp at the base of these peaks. Central Whitegoat SW Slopes(II 5.5) - A nice route with some steep snow and one short difficult rock section. 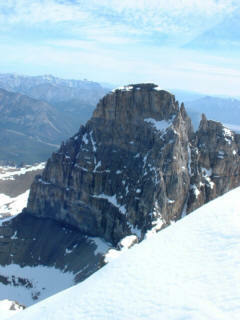 North East Peak from Central Peak summit.